Ever since I can remember, my mother has thrown a lovely Christmas Eve dinner party. It’s a dressed-up affair that begins right after Christmas Eve Mass with shrimp cocktail, stuffed mushrooms, and oyster stew, and ends—after huge platters of lasagna are served and enjoyed—with dessert (vanilla ice cream for the kids and a Grasshopper for the adults). One particularly merry eve when I was around ten, the dinner plates were cleared and my mom unveiled something new she had spent the afternoon making—a beautiful blueberry cream cheese tart with a crumbly, homemade pecan crust. My dear mother. It was obvious within the first few bites that the crust was severely burnt. The guests were having trouble chewing and swallowing, though everyone—friends and family alike—was too polite to mention it, instead carrying on pleasant conversation while reaching for their water glass. Our parish priest, still in his collar, was seated at our table and he ventured to use the side of his fork to casually (but determinedly) cut his next polite bite. Before we knew it, a quarter-size piece of burnt pecan crumble crust shot across the table like a bullet and landed on my grandmother’s plate. All eyes quickly turned to my mother to measure her response. To everyone’s relief, she broke out in raucous laughter and we all followed suit, howling until we had tears in our eyes. The niceties were over; the crust was a flop. But the dinner party? Still fabulous. Of course, this is not exactly how my mother had hoped her tart would turn out that year. It’s also probably not the one moment out of three decades of beautifully prepared Christmas Eve dinners that she would hope to have been crystallized in my mind forever, but it is. I treasure this memory because it highlights the joy found in imperfection. My mother is a gifted hostess whom I admire immensely. However, on that Christmas Eve in the late eighties, her piecrust was not perfect. The holidays are so often fraught with anxiety and expectation. We worry about everything from money to menus to being face-to-face with the pain of fractured relationships. We struggle to provide magic for those around us and we stress over creating long-lasting memories with every move we make. If only we would let go of some of those long-held expectations and loosen our grip on the quest for perfection. In doing so, we might welcome a better season, one during which we are free to enjoy the depth of relationships and the promise of joy without the heavy weight of flawlessness. Photos and baking wizardry by Erin Ferris. I learned my way around the kitchen under my mother’s wing. Wearing an apron that hung nearly to my ankles and standing precariously on a wooden stool, I inched closer and closer until I all but crowded her out of the head chef’s place at the counter. As we created salads, soups, and casseroles, she taught me the formal techniques I would one day use to feed my family as well how to express my creativity in the kitchen and the art of preparing and presenting food with love. Fifteen years later and as a newly-relocated (read: friendless) newlywed whose other half worked 14 hours a day, I decided to build on what my mother taught me and improve my baking skills. I told myself I took on the project for the sake of our future children, who would of course someday need me to contribute to their schools’ bake sales … honestly, I really just wanted an excuse to lick the bowl and indulge in a few sweet treats myself. As I whipped up banana bread, brownies, lemon bars, and carrot cake with cream cheese frosting, I realized that each recipe – even halved – produced more than my little family could consume. Rather than dump the extras into the trash, I started sending them to work with my husband or taking them to my office. My husband’s graduate students sent thank-you emails for the homemade cookies. My coworkers’ faces lit up when they found trays of cupcakes on the break room counter. And with that, a cycle began: I baked, my baked goods made other people happy, I felt happy, and I baked again. I didn’t always love the process, or the cleanup, or the frustration that crept in when I attempted to tweak recipes with disastrous results, but I kept baking because it made me feel good about myself. The cycle continues today, another 15 years later. Despite my family doubling in size and my time commitments doubling in number, I still bake for my husband, kids, friends, and friends’ kids. For sporting events. For school functions. For Fridays. At times my inability to turn down a request for baked goods – no matter how full my schedule – baffles me. And then last month I came across this article. As the choir sang “Alleluia,” the heavens parted and a beam of light illuminated my stove like a pot of gold at the end of a rainbow. Suddenly it all became clear. Should your busy schedule keep you from reading the article in its entirety, here’s a summary: making other people happy makes us happy, and when we care for others, we care for ourselves. Baking provides a creative outlet. Research has found an inverse relationship between creative expression and stress, meaning the more we express ourselves creatively, the lower our stress levels. Baking promotes mindfulness, which has been connected to increased happiness and decreased stress. Because baking requires physical and mental focus and attention to detail, it requires us to be present in the moment. Ohana also explains that baking promotes balancing the moment against the bigger picture, something that can be difficult to master. Of course these benefits to baking apply only if you feel comfortable in the kitchen. If baking causes you stress, steer clear…but then find your gift and put it to use in the same way many of us use baking. A friend of mine is an incredible knitter and she loves to make scarves and hats and mittens for friends. Another friend creates beautiful leather bookmarks and pops them into books when she lends her favorites. These Mama Bears enjoy their personal creative outlets and appreciate the feelings of accomplishment and happiness that come from caring for others. Though I didn’t realize it until last month, for 30+ years I have measured, mixed, and decorated as a way to work out my creative energy, let others know how I feel, and spend time alone with my thoughts. Now that I know the benefits, I anticipate another 30+ years of the same. Mama Bear contributor Erin Ferris is a wife, mother, and writer living in College Station, Texas. She loves snow, tulips, donuts, cowboy boots, kittens, musical theater, college football, crime dramas, young adult fiction, and the color red. After working for the American Red Cross for nearly 10 years, she stepped away from the nonprofit world to focus on her favorite part of that job: telling meaningful and impactful stories. She contributes a monthly “Mama Bear Self Care” post to the Mama Bear Dares Blog, and you can find her at Chasing Roots. When I was growing up, there weren’t many women from the Bible elevated in sermons. 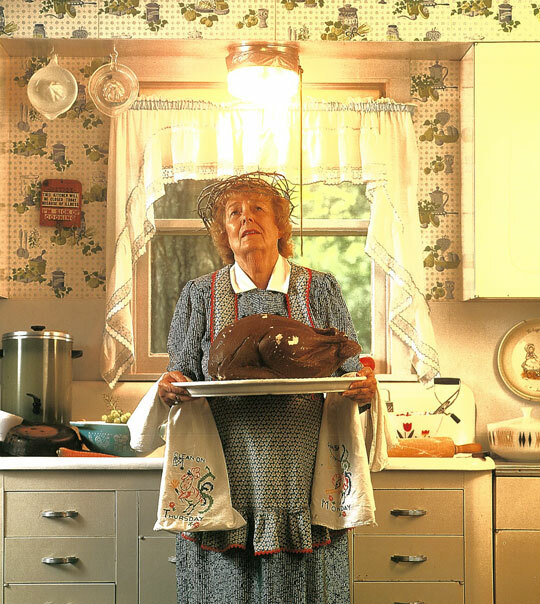 Yet I could always count on the Mother’s Day service to include a reading from Proverbs Chapter 31 followed by an oration praising the noble wife presented and extolling her domestic perfection. Because of this yearly tradition, there was a season of my young adulthood in which I resented the proverbial “perfect woman.” She seemed to have all the qualities I lacked. She was an early riser, a tidy housekeeper, and the bearer of many children. She mystified me, I guess. Was she a spokeswoman to represent the important work of womanhood? Or was she an unrealistic figure of excellence who would haunt me forever? I have since come to see her as both. She is at once an exemplary, model woman and an exaggerated, mythical creature. When I say "myth" I am not disrespecting sacred scripture, nor downplaying this figure’s power. Karen Armstrong, author and religious scholar, calls something a "myth" if it happened once and also happens all the time. I find this definition fitting for our heroine, the Proverbs 31 Wife, because she was likely a composite made up of real traits that existed long ago … and her characteristics also echo now into our contemporary day and age. This “myth” language gives me permission to accept our ancient Wonder Woman not by dismissing her qualities, but by holding her lightly—playing, even, with the imagination of her, contemporized. I invite you to join me as I lift up motherhood with the help of biblical wisdom. As I revisit Proverbs 31 now, I’ve noticed some things that didn’t stand out before. For example, it seems that the woman introduced is a woman of means. She considers investments, she has support staff to carry out her household chores. However, these are not the root of her fulfillment. Instead, verses 26-28 remind us what gives mama her true wealth, her real power. The writer says of this amazing woman: “She opens her mouth with wisdom … her children rise up and call her happy.” What is her wisdom? What makes her happy? The answer stems from the things that cannot be bought or brokered; it rests in the realm of home and hearth, the community of wise women, and the support of a loving, faithful marriage. And so, I second those words and I say unto you: Mothers, wherever you are, glory to you for the wisdom you share with one another, for the ways you tend to your children’s hearts so that they feel loved, safe, and secure, and for the times they catch you truly delighting in them, in yourself, and in your life ... and they rise to regard you as happy. Karen Armstrong, The Case for God (New York, 2009) p. xi. Kendra Thompson is a part-time minister and full-time mom living in Davenport, Iowa. In her spare time, when she's not at the mall, she blogs at Cry Laugh Snort. It was late July and the summer days were numbered when we decided to venture out and try a new swimming pool. The neighborhood moms and I packed our swim bags, grabbed our towels, and sun-screened all the people for an adventure. This new pool had a high dive, which is rare anymore as it falls straight into the “too-dangerous-for-kids-these-days” category. To participate in the high-dive fun, it was mandatory to pass a swim test. My oldest daughter is an anxious perfectionist (her apple falls very near her mama’s tree) who rarely tastes defeat. For this reason, practicing failure was an ever present “to do” for her dad and me, but we found contriving situations for kids to fail is easier said than done. I knew the moment she asked if she could take the test that my answer would be an enthusiastic YES. She is a capable swimmer, so I wasn’t throwing her to the deep end sharks, but this test exceeded her capabilities. She would get to experience that bitter mix of disappointment that comes so infrequently to kids these days. I gathered round the side of the pool with the other onlookers, a knowing smile on my face because this moment had failure written all over it. Some might say the sense of elation I got when given the opportunity to watch my daughter fail was inappropriate. Yet, I had been diligently looking for a moment to practice failing and, when one fell in my lap, I breathed a sigh of relief. What better way to practice vulnerability? And tenacity? And resolve that failure isn’t the end, but only a step along the way. In an era of participation trophies and everybody gets a turn fair play, our kids often miss out on experiencing failure. And we all fail at some point or another … I find myself failing nearly daily some weeks! Without failure, there would be no great successes. After all, life is about how you handle Plan B (or C or D.) It can be hard to find opportunities to practice failing, but it’s a skill that should be tried on for size in childhood. Adulthood is a series of small (and large) failures that lead to great victories and, without practice, failure can be wholly overwhelming. She didn’t pass the swim test that sunny July day. She cried hot tears down her chlorine-soaked cheeks and we got to have a thoughtful talk about how failure felt, and, more importantly, how she would try again another time. We got to talk about what she could do differently and how, despite being upset, she really was okay. Even better than okay—she was prepared with the tools to succeed the next time around. My Mama Bear sunned herself on the warm pavement around the pool that day. While it’s never fun to watch your child crumble in the agony of defeat, it’s a great feeling to know they are fine-tuning a life skill that will take them (slightly more) comfortably into adulthood. Mama Bears fail and rise again…frequently…and it’s a gift to be able to pass this down to our cubbies. What might happen if we dare to fail boldly, comfortably, and completely out loud? What if we let our children fail and then showed up to be there to help them rise again. That's my dare for you: Don't let the shackles of failure weigh you down. Instead, know that each failure teaches you exactly what you needed to learn. Mama Bear contributor Abbie Keibler is a full-time working mama to three girls born within three years. She married her preschool sweetheart and settled within five miles of both sets of their parents after years spent college-ing in other states. Abbie loves being immersed in nature, her family's tradition of pizza and a movie on Friday nights, and putting words together to make them dance off the page.